The text of this manuscript is mainly a much-expanded version of the commentary by Peter Lombard (d. c.1160). The Latin text of the psalms is written in short sections in large double-spaced script, and the commentary on each of these is written in single-spaced lines in French. There is an erased 14th-century ownership note and anathema of 'Lexyngtona', and another flyleaf note 'Lexhinton', which probably indicate ownership by Laxton in Nottinghamshire. There is also a later press-mark and an erased ownership inscription of the Dominicans of Exeter. 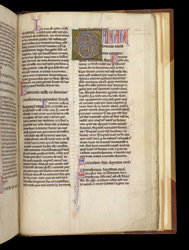 The illuminated initial 'D' marks the start of Psalm 97. This volume covers Psalm 51-100, so it must have originally formed part of the three-volume set, each containing 50 Psalms: 1-50, 51-100, and 101-150.